افشای دلایل محرمانه برای متهم به موجب مادة (2)67 اساسنامه از تکالیف دادستان و از عناصر اساسی محاکمة عادلانه است. این امر باعث می‌شود تا متهم پیش از شروع مرحلة تأیید اتهامات از دلایل محرمانه علیه وی مطلع و خود را برای دفاع در مقابل اتهامات خویش آماده کند. اما تأیید اتهامات، از موضوعات بدون تشریفات و ارزیابی استدلال‌های مطرح در دفاع از اتهامات و رعایت پیش شرط‌های آن نیست، تا اینکه شعبة مقدماتی بر اساس آنها نسبت به تأیید یا رفع اتهامات اقدام نماید. بر اساس مقررات مادة (7)61 اساسنامه، بررسی موضوع «تأیید اتهامات» به این مقوله می‌پردازد که آیا دلایل کافی برای احراز ارتکاب جرم از ناحیة متهم وجود دارد؟ متهم در جلسة تأیید اتهامات، نه تنها حق دارد که اتهامات را ردکند، بلکه حق دارد با اطلاع پیشین از دلایل محرمانة ارائه شده از سوی دادستان علیه وی، آنها را به چالش بکشاند و حتی برای رفع اتهام از خود دلایل محرمانة دادستان را کنار بزند و دلایل خویش را جایگزین آن‌ها نماید. The disclosure of confidential reasons the defendant under Article 67 (2) of the Statute is one of the duties of the prosecutor of the essential elements of a fair trial. The disclosure of confidential reasons to allow the accused before the confirmation of charges to be informed of the reasons for confidentiality and prepare to defend. But without formalities and evaluate arguments in support of charges of topics in the field, to the Pre-Trial Chamber to confirm or not the charges. According to the provisions of Article 61 (7) of the Statute, the issue of "confirmation of charges" refers to the issue of whether sufficient grounds for obtaining accused of having committed crimes there? The defendant in the session confirmed the allegations, not only has the right to have the charges dismissed, but the right to notice of the reasons for confidentiality provided by the prosecutor, they will challenge even for the charges of his own confidential reasons, the prosecutor rejected and would provide its reasons. صالحی، جواد (1394)، «بایسته‌ها و چالش‌های افشای دلایل؛ جلوه‌ای از حقوق دفاعی متهم در اساسنامه دیوان»، مجله پژوهش حقوق عمومی، شماره 48، صص 68-47. 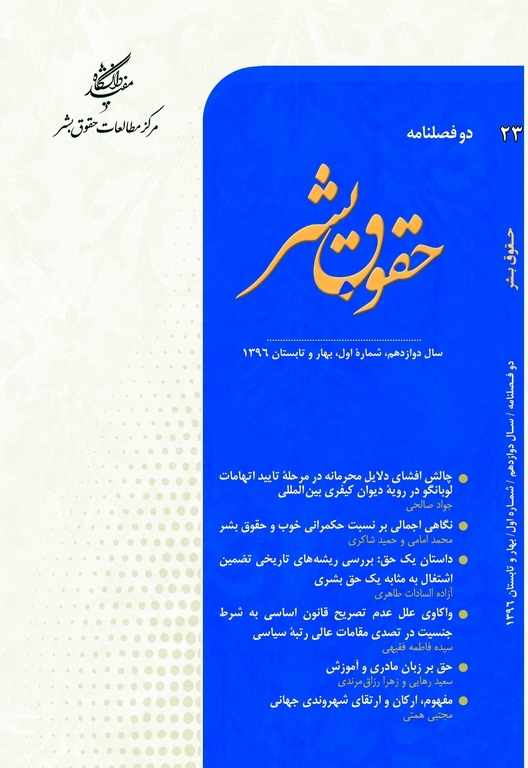 صالحی، جواد (1395)، «حمایت از امنیت مخبرین در رویة قضایی دیوان کیفری بین‌المللی؛ استثنایی بر جرم علیه عدالت کیفری یا سوءرفتار نزد دیوان»، مجلة حقوق تطبیقی، شماره 105، صص 186-169. فاخری، نریمان و جواد صالحی (1393)، «رویة شعب بدوی و تجدیدنظر دیوان کیفری بین‌المللی در اصلاح اتهامات لوبانگو: از هماهنگی تا تعارض میان آیین‌نامه دیوان با اساسنامة رُم»، مجلة حقوقی بین‌المللی، شماره 51، صص 204-183. محمدنسل، غلامرضا (1391)، مجموعه مقررات دیوان بین‌المللی کیفری، تهران: انتشارات دادگستر، چاپ دوم. Ambos, Kai (2009). “Confidential Investigations (Article 54(3)(e) ICC Statute) vs. Disclosure Obligations: The Lubanga Case and National Law”, New Criminal Law Review, Vol. 12, pp. 543-568. Whiting, Alex (2009). “Lead Evidence and Discovery before the International Criminal Court: The Lubanga Case”, Journal of International Law and Foreign Affair, No.207, pp.207-233. Prosecutor v. Bemba, Decision on application for Interim Release, Case No. ICC-01/05-01/08-323, 16 December 2008. Prosecutor v. Lubanga, Decision Requesting Observations concerning Article 54(3)(e) Documents Identifies as Potentially Exculpatory of Otherwise Material for the Defence’s Preparation for the Confirmation Hearing, Case No. ICC-01/04-01/06-102, 15 May 2006. Prosecutor v. Lubanga, Judgment on Appeal of Disclosure Decision, Case No. ICC-01/04-01/06-1486, 21 Oct. 2008. Prosecutor v. Lubanga, Transcript of Hearing, Case No. ICC-01/04-01/06-54, 23 March 2006. Prosecutor v. Lubanga, Transcript of Hearing, Case No. ICC-01/04-01/06- T-4 EN, 24 April 2006. Prosecutor v. Lubanga, Decision on the Final System of Disclosure and the Establishment of a timetable, Case No. ICC-01/04-01/06-102 Annex I, 15 May 2006. Prosecutor v. Lubanga, Decision Regarding the Timing and Manner of Disclosure and date of Trial, Case No. ICC-01/04-01/06-1019, 9 November 2007. Prosecutor v. Lubanga, Prosecution's submission on Article 54(3)(e) confidentiality agreements, Case No. ICC-01/04-01/06-1267, 7 April 2008. Prosecutor v. Lubanga, Transcript of the status conference, Case No. ICC-01/04-01/06-T-65-ENG, 13 December 2007. Prosecutor v. Lubanga, Transcript of the status conference, Case No. ICC-01/04-01/06-T-78-ENG, 12 March 2008. Prosecutor v Lubanga, Transcript of the status conference, Case No. ICC-01/04-01/06-T-79-ENG, 13 March 2008. Prosecutor v. Lubanga, Prosecution's submission on undisclosed documents containing potentially exculpatory information, Case No. ICC-01/04-01/06-1248, 28 March 2008. Prosecutor v. Lubanga, Order on the 'Prosecution's submission on undisclosed documents containing potentially exculpatory information, Case No. ICC-01/04-01/06-1259, 3 April 2008. Prosecutor v. Lubanga, Prosecution's additional information on the Undisclosed Evidence, Case No. ICC-01/04-01/06-1281, 15 April 2008. Prosecutor v. Lubanga, Transcript of the status conference, Case No. ICC-01/04-01/06-T-86-ENG, 6 May 2008. Prosecutor v. Lubanga, Prosecution's information on documents that were obtained by the Office of the Prosecutor from the United Nations pursuant to Article 54(3)(e) on the condition of confidentiality and solely for the purpose of generating new evidence and that potentially contain evidence that falls under Article 67(2), Case No. ICC-01/04-01/06-1364, 2 June 2008. Prosecutor v. Lubanga, Judgment on the Appeal of Lubanga against the Decision on the Defence Challenge to the Jurisdiction of the Court pursuant to article 19(2)(a) of the Statute of 3 October 2006, Case No. ICC-01/04-01/06-772, 14 December 2006. Prosecutor v. Lubanga, Redacted Version of ‘Decision on the prosecution`s Application to Lift the stay of Proceedings’, Case No. ICC-01/04-01/06, 3 September 2008. Prosecutor v. Lubanga, Réponse de la Défense au mémoire déposé par le Procureur au soutien de son appel contre la Décision du 13 juin 2008 ordonnant la suspension des procédures, Case No. ICC-01/04-01/06-1447, 25 July 2008.